Epipelagic: The familiar surface waters, where most of the energy input (sunlight) occurs, and food chains begin primarily with phytoplankton ("plant drifters"; mostly microscopic algae such as diatoms). Life can be abundant, if nutrients and sunlight are plentiful. By far the most studied habitat, it goes only to a maximum of 200m deep (maximum depth of light adequate for photosynthesis). Consider that in comparison to the average ocean depth at 4000m, going down to 11,000m! See also our Epipelagic page. Meso-, Bathy-, Abysso-, Hado-Pelagic: Below the epipelagic in the deeper zones, food chains are energy-poor (due to lack of sunlight) and usually begin with detritus and bacteria. Since no algae can grow in these zones, life gets sparser the deeper one goes. Most animals have watery, gelatinous low-energy muscles and other tissues, and sluggish, low-metabolism lifestyles. 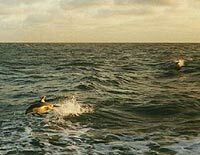 These features were originally thought to be ways to cope with low food energy--the "low-energy" hypothesis - but the features are also found in animals near Hawaii where there is more food available than in temperate zones. The alternative"visual-interactions" hypothesis proposes that the lack of light means that animals with eyes do not need robust muscles since they only need to be able to dart briefly in the darkness when a predator or prey come close enough to see. The Mesopelagic (=midwater or "twilight zone"), where there is still faint light but not enough for photosynthesis (about 200m-1000m). Bacteria, salps, shrimp, jellys, swimming (cirrate) octopods, vampire and other squids, and fish are typical; many are bioluminescent. 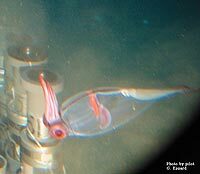 The Bathypelagic and Abyssopelagic ("midnight zones"), which are even deeper (with depths not clearly defined). Finally, the deepest tectonic trench is about 11,000m, with those habitats sometimes called Hadopelagic. 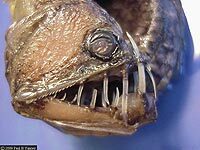 Examples of deep pelagic animals are shrimp and anglerfish, though no fish has ever been seen or caught below 8,400m. We have not yet studied these deepest habitats, but our Mesopelagic/Midwater page has some bathypelagic species and links.